Burberry is presenting edition for women signed by perfumers of the house of Givaudan Nathalie Cetto and Antoine Maisondieu. while orange and iris add a dose of sensuality ". This is the first fragrance by Burberry that has lavender as central note that plays the main role in the composition. English lavender is much more aromatic that the French lavender and its shades in this composition are more prominent. Creator's and perfumer’s wish was to use the typical ingredient arriving from England – as pointed out by Nathalie Cetto. and floral notes of Petalia playing till the base notes. that you are in a cloud of peony petals! 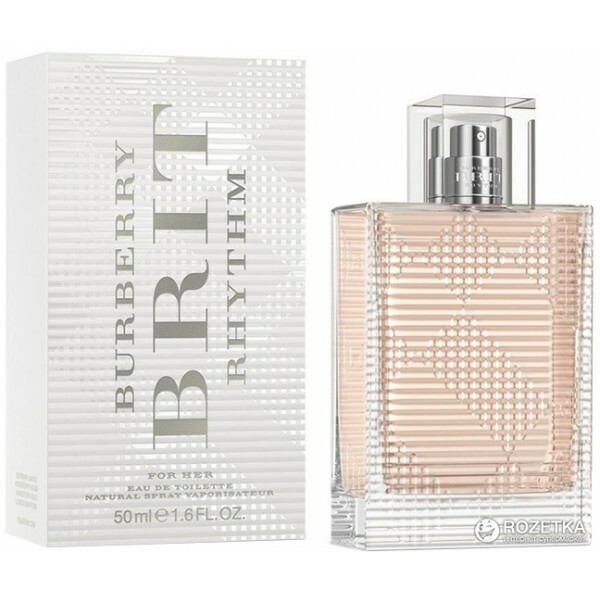 Just like the version for men Burberry Brit Rhythm for Men the fragrance for women is closely connected with music and acoustic performance – explains Christopher Bailey. Like previous perfumes of Burberry collection, the new fragrance for women features DNA of the brand and follows the style of the house. He adds: "Rhythm for Women has the aim to capture emotion, excitement and attitude that live music provides. That is truly a kind of adrenaline that you get from the music..." Fluid color of the new perfume is soft pink and contains powdery softness and sensibility. and orange blossom combined with specially patented molecule of the house of Givaudan named Petalia carrying the scent of peony accords. Beli parfum original Burberry Brit Rhythm 30ml for Women sekarang, harga termurah di Indonesia! !